One of the big issues I have with finding long sleeve tops is length. Length of the torso and length of the sleeves. 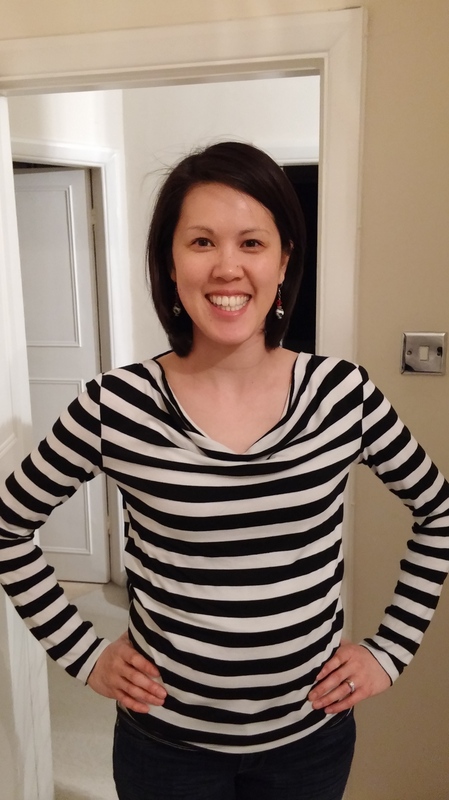 I have long arms, and can never find long sleeve tops that fit my torso and don’t eventually become 3/4 sleeved after 1 wash.
I’d been watching the Great British Sewing Bee (I realise that admitting this may put me in granny territory) and it’s really motivated me to start sewing again! I found this great sewing shop in London called Sew Over It. They have these amazing sewing classes and patterns that look intermediate friendly. It’s been a cold winter and a cold spring (so far), and I find myself turning to long sleeves on a regular basis. As a result, the first pattern of theirs that I tried is the Cowl Neck Top and dress. I liked that it could be used to make a long sleeve or short sleeve top or dress. I had some striped jersey in my fabric box and decided to use it for this top. I don’t have an overlocker, so I did all of this on a traditional sewing machine. The instructions call for zigzagging the edges of the jersey and using a straight stitch for the seams. I decided instead to use twin stretch needles to sew all of my seams and hems so that the stitches would give when stretched. Overall, a really easy pattern to follow and quite simple to put together! I’m really happy with the stripey long sleeve and have already worn it many times since completing it. I’ve just bought more jersey to make more versions of it! I definitely chalk this project up to a success!